I suppose now that Christmas and the festive season is over, I should get to packing up my Christmas tree and it's decorations to hide for the new year. But I can't pull myself together after an actually perfect Christmas. It's such a weird feeling to be saying goodbye to a whole year but it was a true celebration with friends and sparklers alit. I'm now transitioning into my second year of study and I believe I am much more confident about how I will be working my way around assignments this trimester. I hope to learn from the few mistakes I have made last year and hopefully swerve around similar issues that may come by this year. With that being said, my goals and ambitions are still very much the same. I have realised that I am now one year down to living on an acreage and though I still have many many more years until then, my heart beats heavily at every thought of that house. People dream to travel, become politicians, meet their hero, become famous, or sail the seven seas. I for one dream none of those things although I'm sure the perks of being well-known would be nice to taste for a day or two -think of all the dresses one can afford! But my dream is merely as simple as a thought compared to what many may desire for themselves. I honestly think I'm asking for the moon and back with this one since I can be very specific with what I want but God knows that already and all I can do for now is dream dream dream. 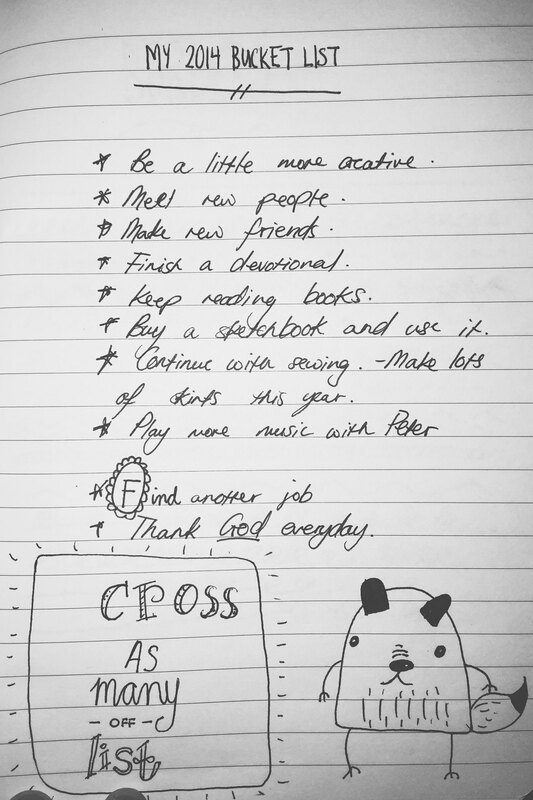 As for what I have achieved in 2014, I only remembered last night that I had written myself a small bucket list but I haven't acquired the right magical skills to use my scanner in the study room. Can you tell I'm a dreamer now? 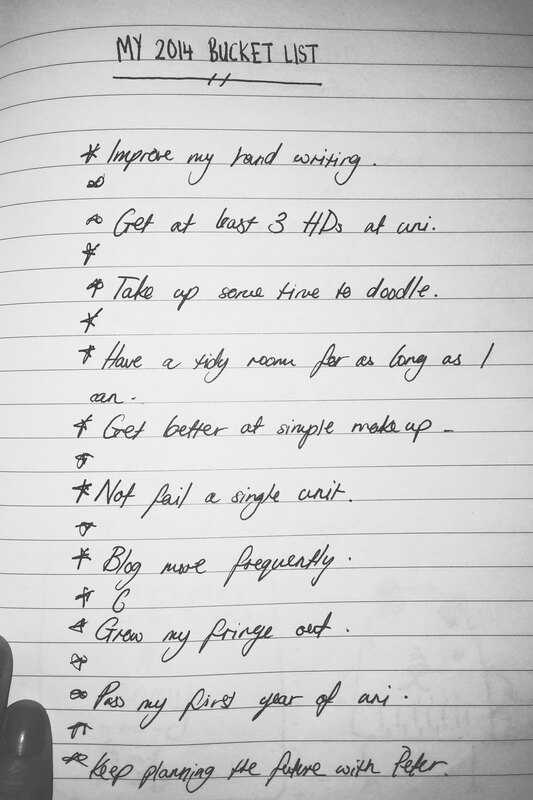 *I never got to improve my handwriting, I mean I didn't feel the need to anymore as soon as uni started as I only every wrote for tests and use my laptop for everything else. *I also outdid myself with HDs this year! I'm so proud of myself, I thought they'd be a little harder to achieve but I had a total of 7 in the year. *I took up 4 weeks of doodling and that was it. It was too hard for me. I couldn't find enough creativity to continue so naturally I stopped. *At the beginning of March 2014 I painted my room white and threw out what seemed like a plethora of rubbish and things I hadn't used for years. Since then, I am proud to say that my room as never been tidier compared to my teenage years. *I'm not sure I've gotten better at simple make-up but I have slowly ditched the everyday foundation routine. I've since changed some of my products for my cleansing routine to things with less chemicals and are a little more natural. I'm either just comfortable in my own skin now for what it is or my skin has grown into my age and I'm more than okay with only the little blemishes. I also believe I have mastered the cat eye. * I blogged here and there once again this year and I feel that this is of course a goal I will continue to work on even if i have to change the direction of where my blog is heading for the time being. I hadn't realised how hard it was to balance assignments with brainstorming for posts even at least weekly. *I've grown my fringe out! For all I knew, I lived a year forgetting about this bucket list but I seemed to have unknowingly ticket a few off. It took a while, but I am fringeless. But I'm thinking of cutting a new one out again. * I'm still doing my third trimester of the first year of uni! I'm still waiting out on passing the rest of my grades. *Ahh yes, I still dream. I continue to add to the mountain of wishes I have for the future. It's fun to dream about it. *Being more creative was a downfall for me this year. I mean, I had my moments here and there but nothing too oustand-ish I suppose. *I did meet new people. *I did make a few new friends -note, I did only make a few but they are a sweet bunch. *Once again, I was halfway through 100 Days of Favour by Joseph Prince but I've never finished a devotional. I don't lose interest but I'm also rather forgetful. *Boy oh boy did I read books... FOR UNI. Actually, I did read a few books here and there and Audible has been a very fun app to use since I couldn't fit reading for a while unless I was being read to in the car. I very much enjoyed Not That Kind of Girl by Lena Dunham. I'm also currently indulging in the Harry Potter series again. *I thought I'd sketch in my diary everyday as previously mentioned, I never got my second month of sketching. *I love Gloria (my Singer sewing machine) because she is the only thing that allows me to be the most creative I can be and this year I made a few pieces but I was mostly proud of the first quilt I had made which was yellow and cream. *2014 was not a year to play music. I was preoccupied and slowly losing interest anyway whilst Peter spent most days (and nights) working hard. For someone who has forgotten about her bucket list for a whole year, I'm pretty happy that I have crossed quite a bit off it. 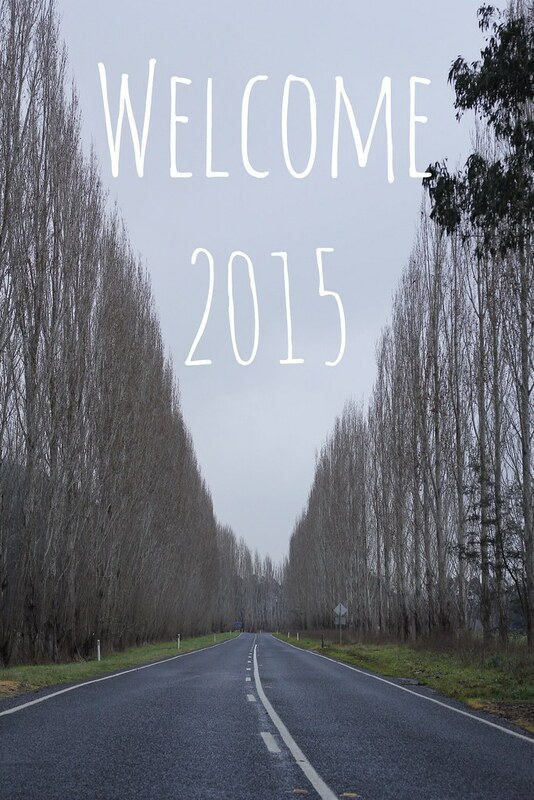 Here's to a new year filled with more goals!